We got a wee bit of snow around these parts recently. I used the opportunity to have a bit of snow fun at the dining room table. I had my faithful assistant, Victoria, go get bowls full of fresh snow and fill an under-the-bed storage container with it. Then I put it on the table with an assortment of little cars and a bulldozer for Alex to do a version of Lonni’s shaving cream snow plow idea from the silly assignment day. He plowed for a while but his hands got too cold, so we moved on. 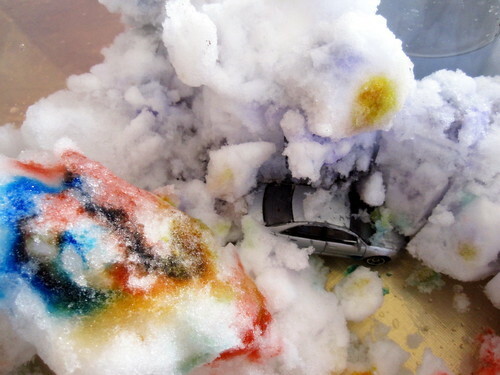 First I packed down the snow and gave him a big paintbrush, a jar of water (right in the tub, so spills wouldn’t matter) and some watercolor paints. 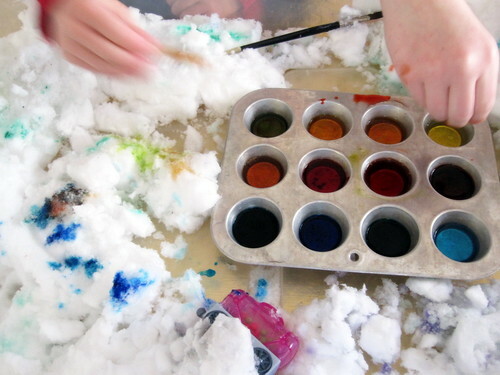 He painted the snow for a bit, but it was a bit tricky. 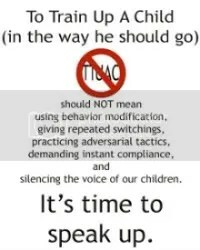 So we moved on. I put out a muffin tin of water and added primary colors to three of them, and then we made all different colors in the cups. I gave Jack, Victoria and Alex all pipettes (like tiny medicine droppers, I get them in bulk from a science surplus store for science and art fun!) and they squeezed colors to their hearts’ contents. It was a colorful, artistic, crazy bunch of fun. Even I got into the act! I highly recommend it next time you have a bit of the white stuff to deal with. 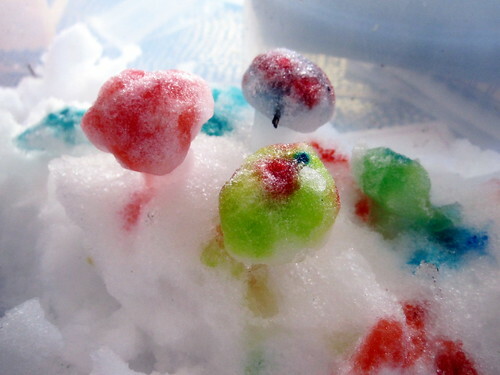 If you don’t have any snow, try mixing up anything white in a similar container and dropping colored water on it. 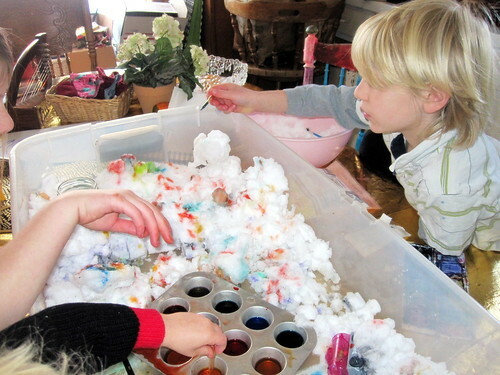 Dry rice, pale sand, shaving cream… Lots of things would be fun to experiment with! Oh, what fun! 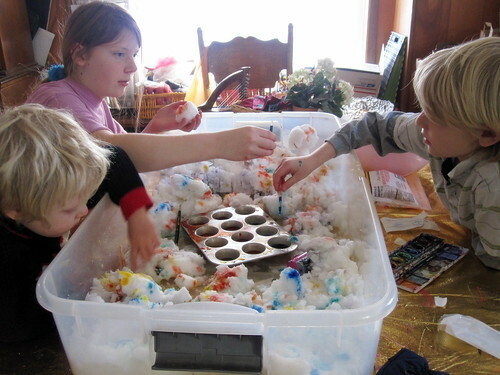 Most of our ‘snow day’ fun is had with fake sow, lol… we’ll have to try the colored water experiments next time we mix some up. We gotta do this yet! We seem to go thru the food color just messing around too so luckily Aldi’s has it cheap! Somewhere I saw the suggestion of using instant potato flakes for snow- like material. Bet that would be fun with the food color too! 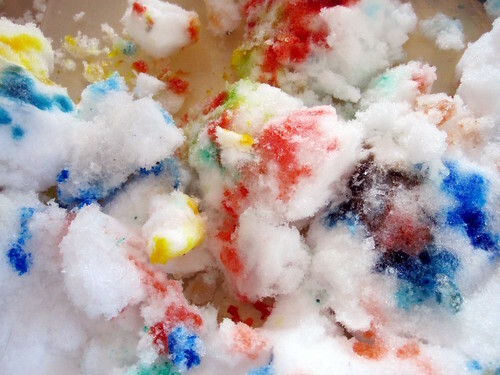 Another similar idea on my to-do list is freezing a block/bowl/pan of ice then sprinkling it with salt and dripping the food color in different spots then watching it melt and etch and seeing the color seep into the cracks. We just froze some balloons full of water with food color mixed in and they came out pretty cool! In most of them the center is more intensely colored while the outer part is clear as glass so you can see thru to the middle ball of color. Neato! We used them for “lawn ornaments” on the snow drift in front of the house. Too much white out there, we needed some color! We also got a lot of snow recently. 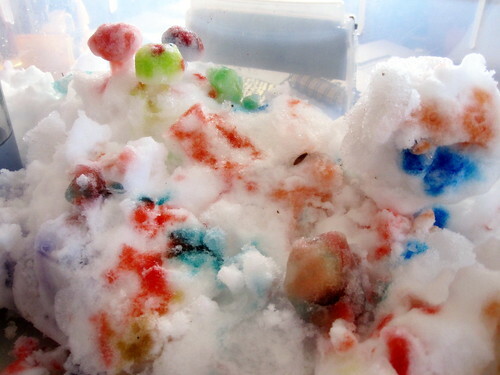 Rather than bringing the snow inside (my 4 year old REALLY wanted to go outside), I filled squirt bottles with food color and water and she made masterpieces outside. Bonus for mom and dad: we colored the snow banks near the end of the driveway/approach so we can easily navigate where the driveway has been cleared so we don’t end up in a snowbank in the cars. 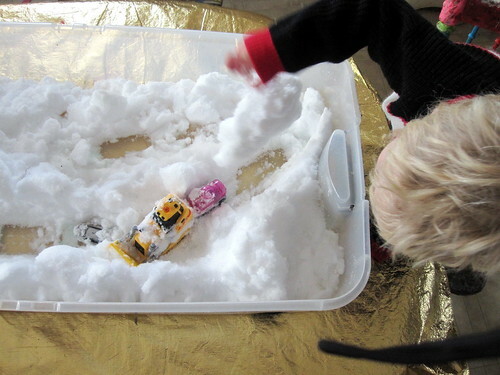 Pingback: Snow Theme Activities: 32 Activities to do with Snow!